I love the way this sunflower is reaching upward to greet the sun! 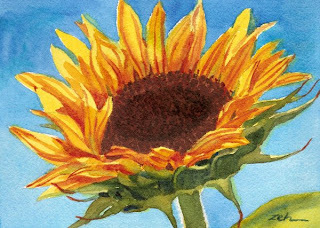 Sunflowers are a warm memory at this time of year when it's dark and cold. We've had a few light snowfalls recently which are just right for the season. One was a bit of an ice storm and every branch and twig was coated with crystal. When the sun came out, it was a wonderland! Just yesterday, my family celebrated Christmas early. Even though it was only Dec. 8th, we all got together for a big Christmas dinner, tree decorated and presents exchanged. The reason? My army son is home from Iraq on leave and he will have to go back before the 25th. We couldn't let him miss Christmas! It was a wonderful time with laughter and love as warm as the memory of this sunflower!